Alabama’s Native American history can be traced back more than 10,000 years, to the Paleoindian Period. Cultural and technological developments brought changes to the societies that inhabited what is now Alabama, as they transitioned from the Paleoindian, to the Archaic, to the Woodland, and then to the Mississippian cultural periods. The Mississippian people are best known for the remarkable earthen mounds they built throughout the Southeast, in Alabama most notably at Moundville in Tuscaloosa County. By the time European fortune hunters and explorers arrived in the region in the sixteenth century, the tribal groups known from the historic period were residing throughout what is now the state. They included well-known groups, such as the Cherokees, Choctaws, Creeks, and Chickasaws, as well as the Alabama-Coushattas and the Yuchis. Beginning with the arrival of the Spanish in the early sixteenth century, Native American society in the Southeast was subjected to continual assaults on their land, the spread of non-native diseases, and exploitation of their resources. In the 1830s, the majority of the Native Americans in Alabama were forcibly removed from their land to make way for cotton plantations and American expansion. 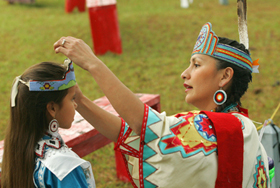 Today, the MOWA Band of Choctaw Indians and the Poarch Band of Creek Indians maintain their traditions on portions of their tribal homelands in the communities in Mobile and Washington Counties and Atmore, Escambia County, respectively.